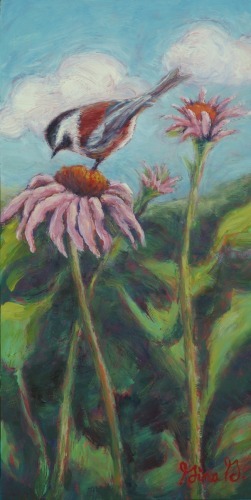 A Chickadee perches on a coneflower looking for food amidst a blue sky with puffy clouds. --Although the original is sold, prints and cards are available. 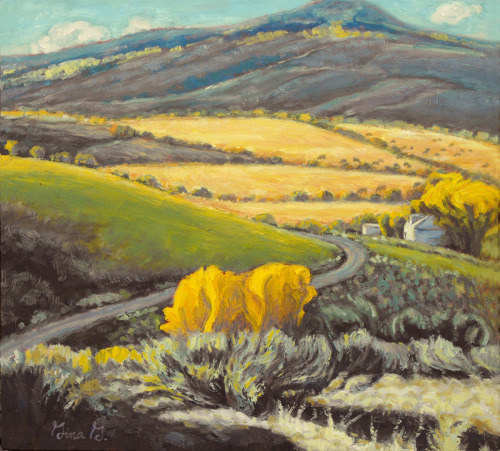 Looking down on the foothills to the mountains at fields of trees and a pasture of horses with a road snaking through. Original oil on cradled panel with sides painted black that is nicely set off by being framed in an oak stained floating frame . Although original is sold, prints are available. 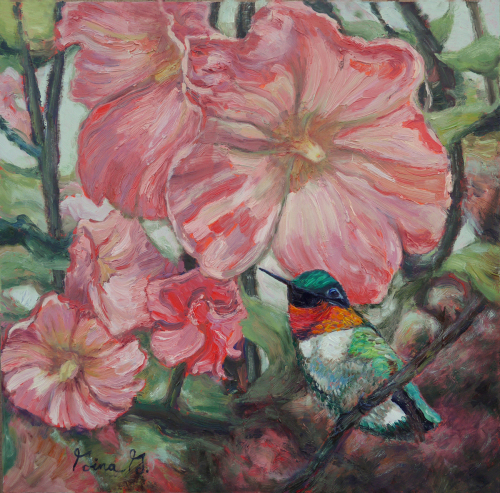 A rufous hummingbird rests amidst hollyhock blooms on a hot summer day. A kitty peers longingly out the window towards a rock walkway and cottontail. Although original is sold, prints available. A majestic Buffalo stands confidently in front of an aspen and pine covered steep mountain bank. Also the original is sold, prints are available. Aerial view of a red truck cruising to a Y in the road. Although original is sold, prints and cards are available for purchase. 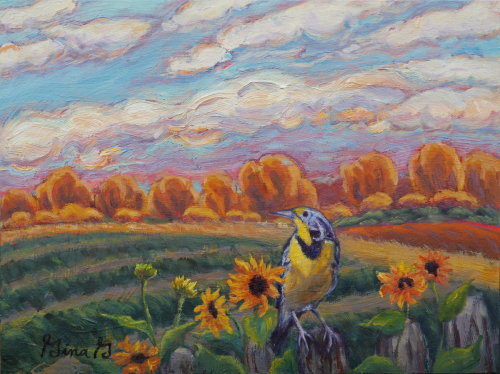 A meadowlark perches on an old wood fence post amidst sunflowers and fields on a late summer day. Although original is sold, prints and cards are available for purchase. 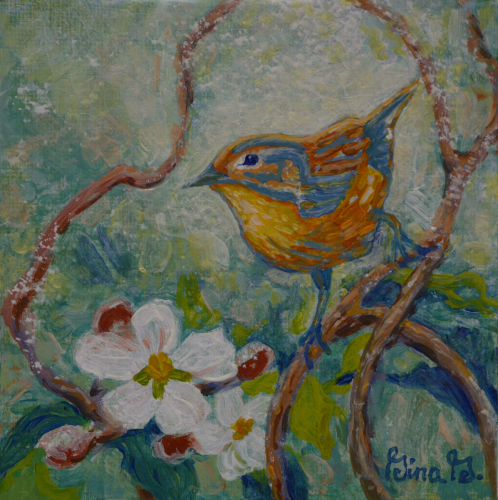 A sparrow perches on a twig with apple blossoms. Mixed media on cradled panel with painted sides. Although original is sold, prints & cards are available. 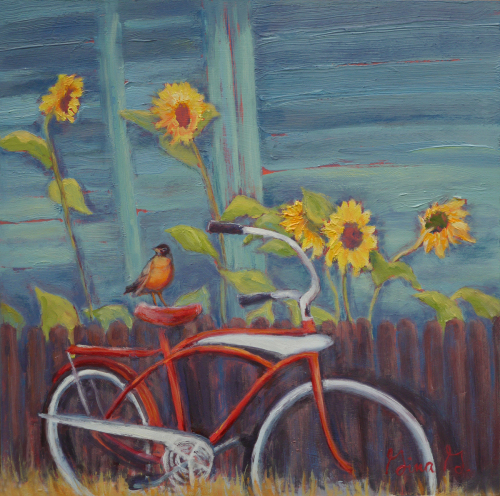 A robin sits on the seat of a classic bicycle. Original oil on cradled panel with painted sides. Although original is sold, prints & cards are available. 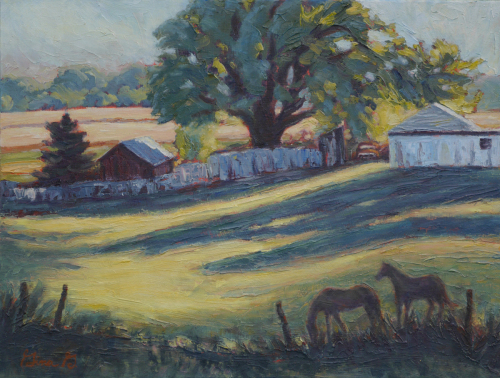 Shadows stretch across a farm and a couple of grazing horses. 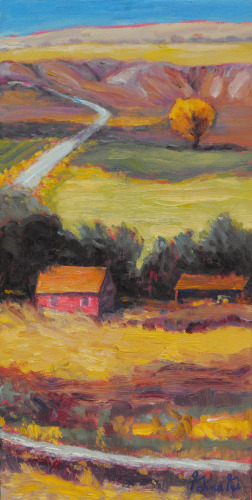 Little yellow house and barn surrounded by sunny fields. 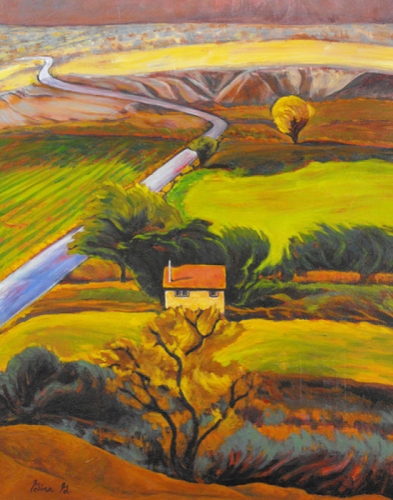 The original painting is painted on a "cradled panel" with the sides painted black. The painting is ready to hang and does not need a frame. Orchard nestled inbetween the adobe mountains and fields below. 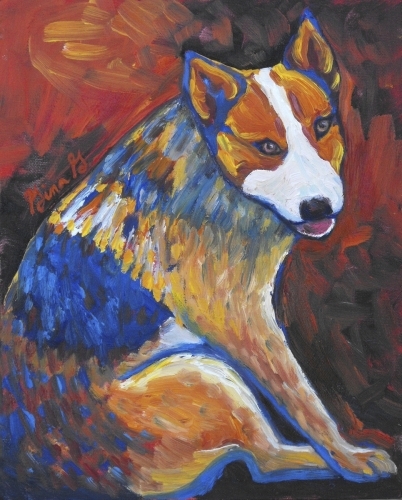 The original painting is painted on a "cradled panel" with the sides painted black. The painting is ready to hang and does not need a frame. Edge of the mountains on a foggy morning in the fall. Fields of sage, grasslands with little white farm house against a backdrop of mountains. 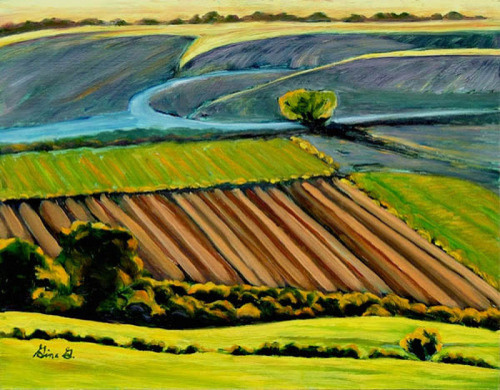 Although original is sold, prints available on Prints & Cards page. 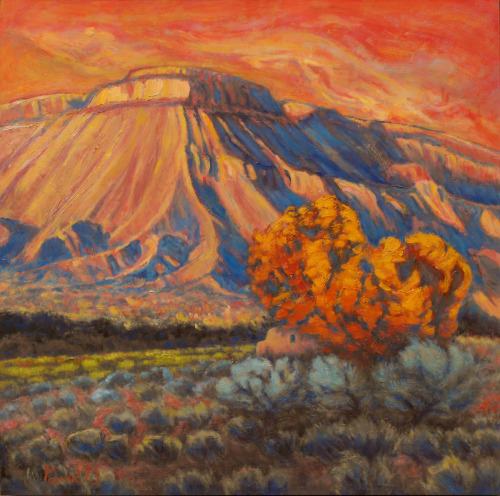 The sun sets on Mount Garfield adjacent to the vineyards in Palisade, Colorado. 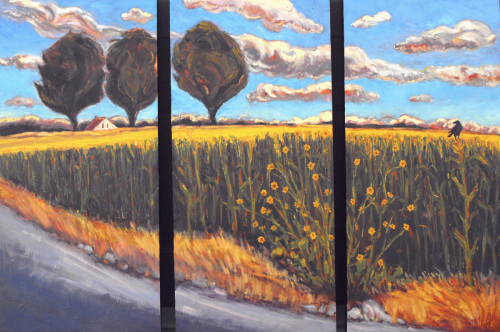 Original oil on cradled panel for a contemporary frameless look that is ready to hang. Prints available on the Prints & Cards page. A fringe of golden trees against backdrop of blue mountains. 2 horses feed quietly within the folliage. 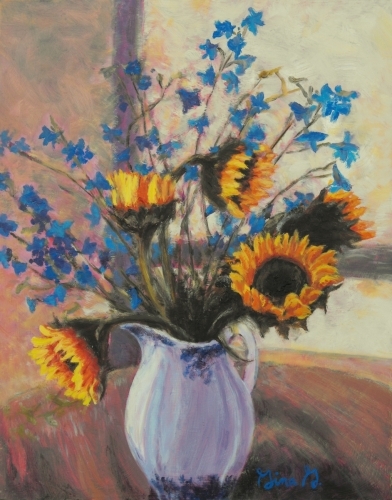 Bouquet of sunflowers & blue flowers in an old fashioned vase. A "cradled panel" painting with no frame needed. The sides are painted a soft yellow and the painting is ready to hang. 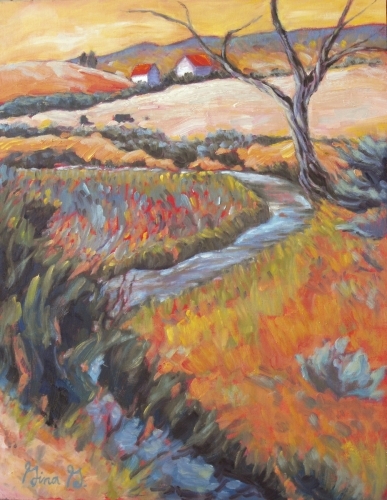 Splashes of color throughout an adobe scene of a stream meandering through the countryside with red roofed houses on the horizon. Golden aspens high in the San Juan mountains in the height of the fall colors. 5" x 5.5"7" x 7.5"9" x 9.75"11" x 12"13" x 14.25"17" x 18.5"
Red heeler sitting pretty ready to get out on the range. 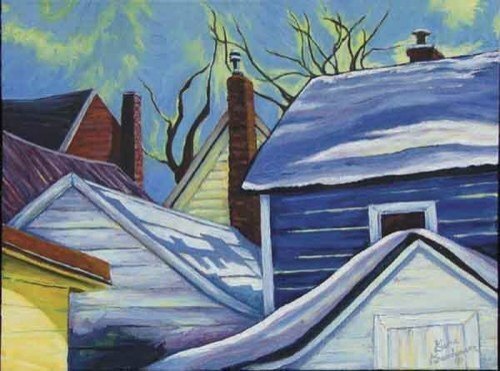 Original Oil on Panel. 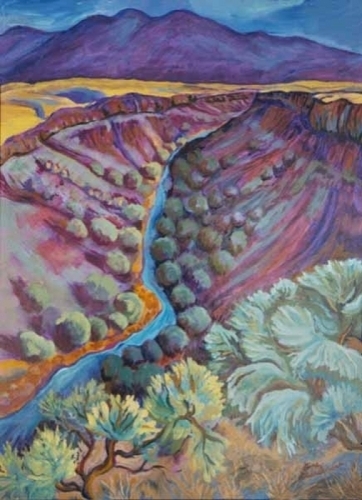 Rio Grande view in the height of September color. Although original is sold, prints and cards are available for purchase. 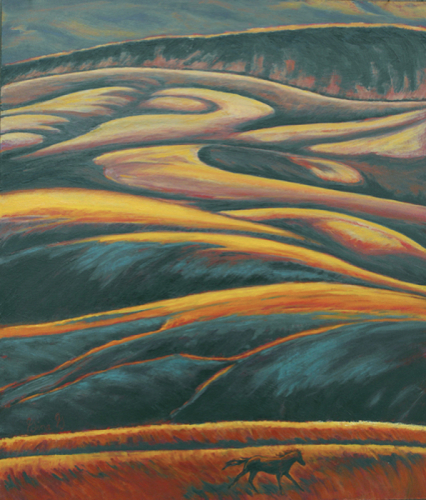 Abstracted, rythmic hills rising above a solitary running horse across golden fields. 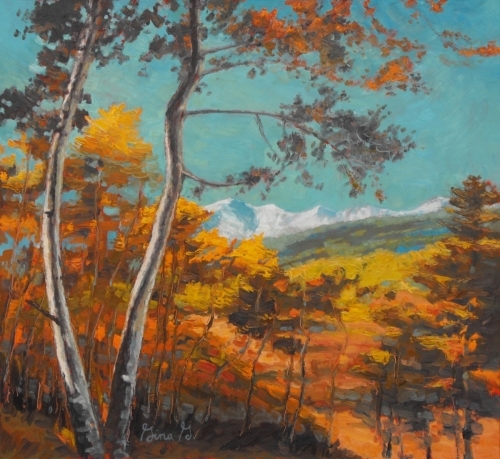 Although original oil painting is sold, prints and cards are available. 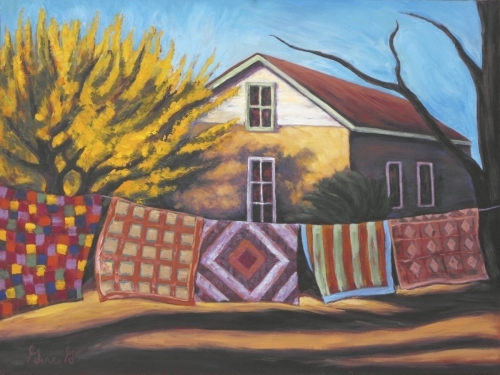 Show of quilts on a clothline in front of a charming stucco southwestern home. Original painting sold, cards & prints are available. 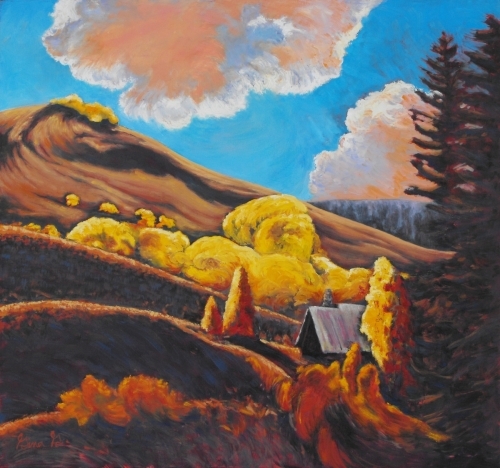 Dramatic light on mountain ridges with A-frame cabin nestled in the golden aspens. Prints and cards available. Also original painting is sold, prints and cards are available for purchase. 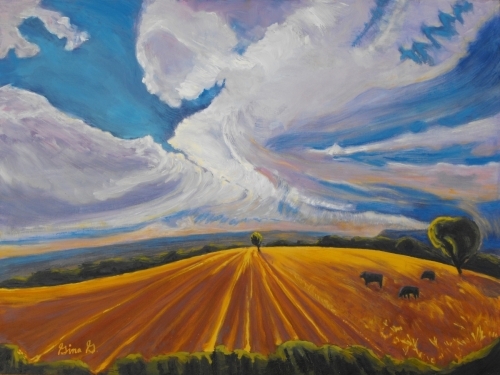 Corn rows converging to a small tree on the horizon with dramatic clouds. 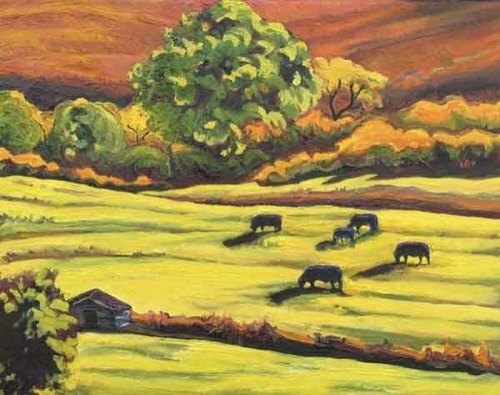 Cows grazing in the field. 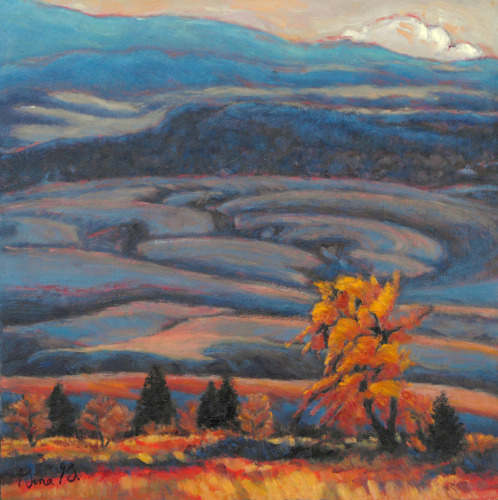 Original painting is sold... see Prints & Cards menu for reproductions. Tranquil scene of a modest stucco home in a western valley with fields and trees. 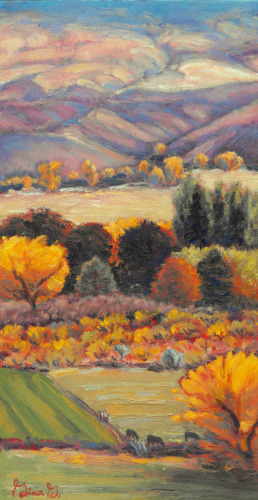 Although original oil painting is sold, prints and cards are available. Layers of Rooftops & fence below cottonwoods. Although original painting is sold, prints and cards are available. Wintry rooftop view of old town Leadville, Colorado. Prints and Cards available. 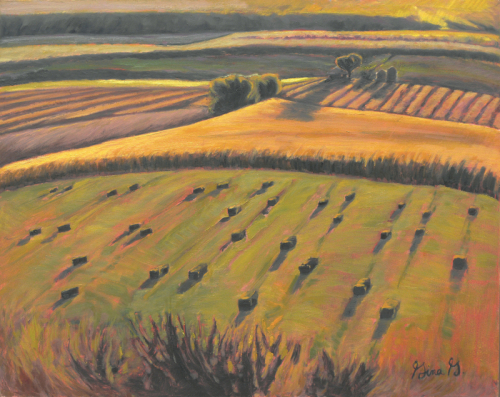 Tranquil scene of farm fields in western Colorado. 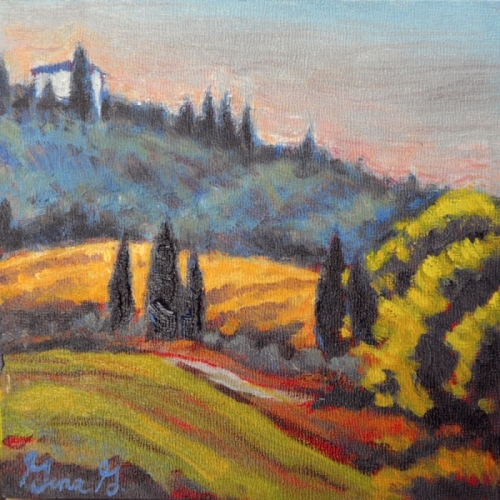 Although original oil painting is sold, prints and cards are available. 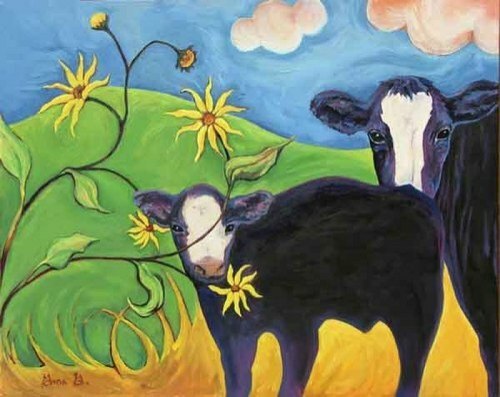 Whimsical mother cow with calf & sunflowers. Prints & Cards available for purchase. 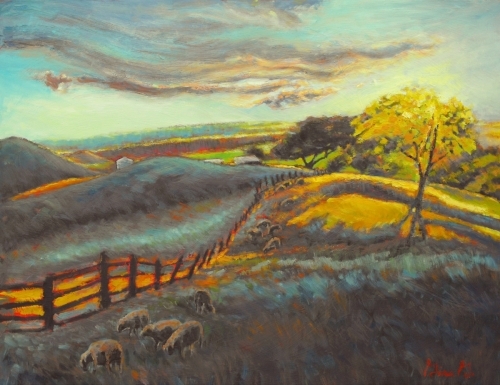 Pastoral scene of cows in a pasture lit by a golden glow from the setting sun. Prints & Cards available for purchase. 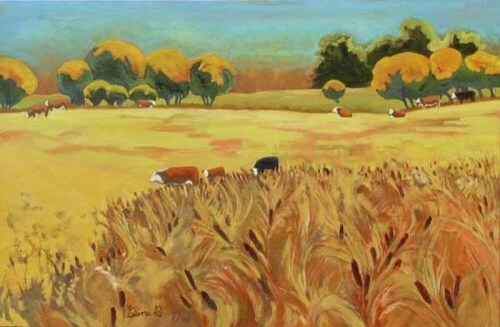 Tranquil scene of cows grazing in golden fields above a thicket of cattails. Original sold. Prints & cards available. 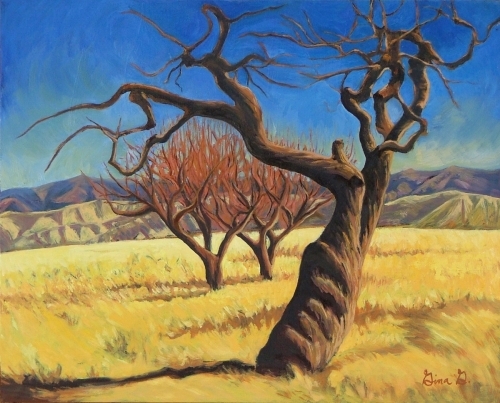 Ancient apple tree sharing a golden field with younger trees in a fall landscape. Prints & Cards available for purchase. 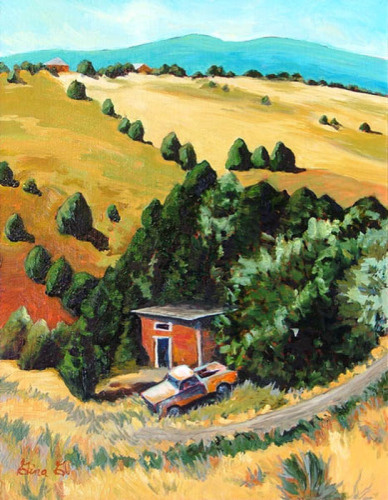 Rolling farm fields in the high country surrounding a secluded home and favorite old truck. Prints & Note Cards available for purchase. 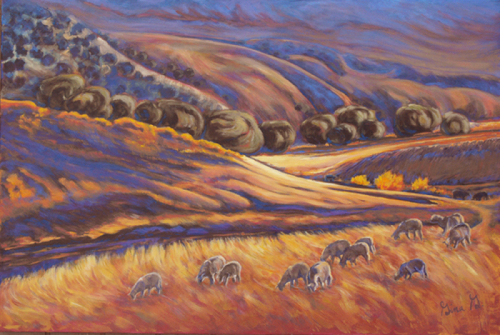 The remnants of light reflecting off the foothills to the mountains with a flock of sheep meandering along the valley floor. Original, artist signed oil painting on canvas. Original sold. Prints & Cards available. Hay bales & angular fields with golden light from the setting sun. 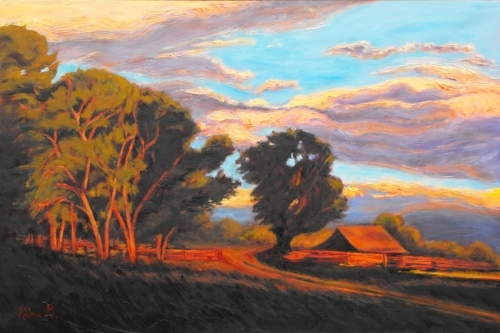 Western view of a barn and farm scene with dramatic skies and a setting sun. 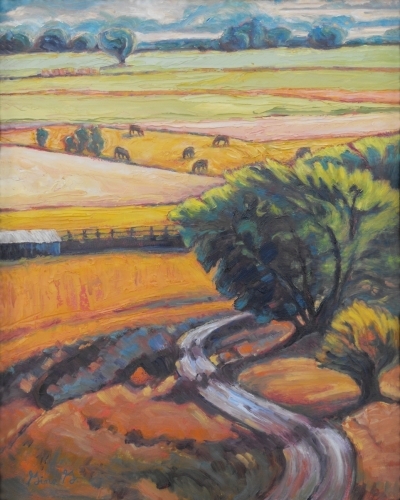 Green field with trees overlooking a colorful valley. 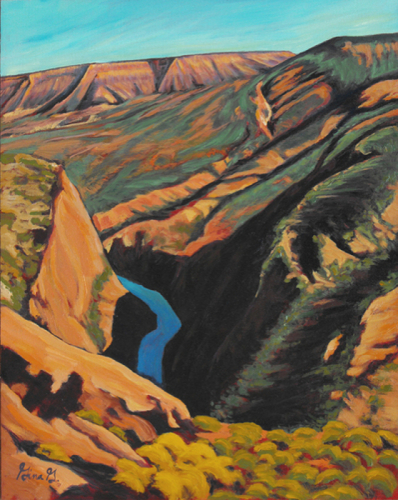 View of the Black Canyon of the Gunnison in southwestern Colorado near Gunnison. 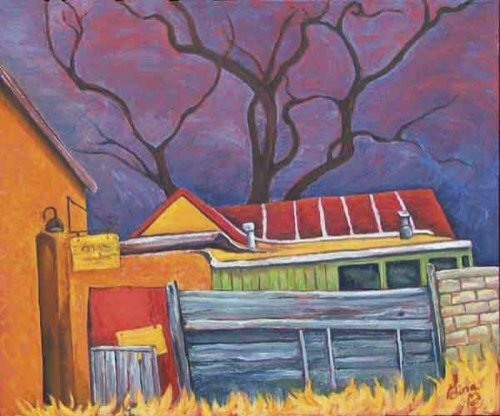 Although original oil painting is sold, prints and cards are available. Rolling hillls in Tuscany, Italy. Original oil is painted on a cradled panel with 1 1/2 inch painted sides. 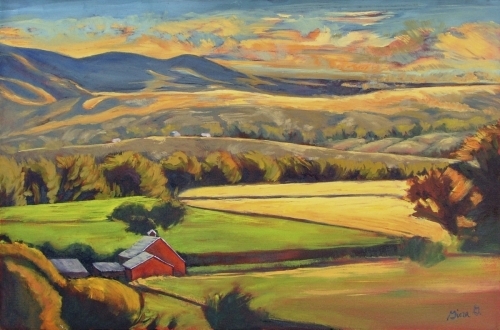 Overlook of red barns, fields and mountains at almost sunset. 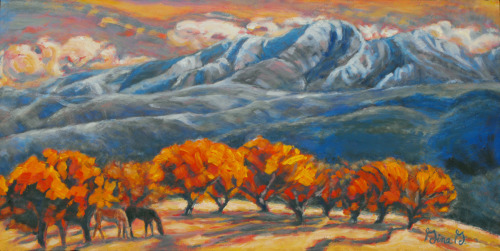 Although original oil painting is sold, prints and cards are available. 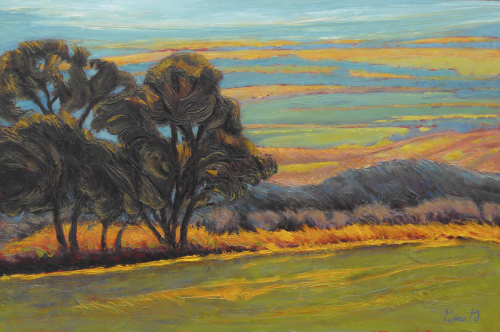 Country road winds through scene of agricultural fields and trees. 3 Panel Triptich. Each panel is 32x15 inchs and 1 3/4 inch deep, the sides are painted black. Sun struck tree near nightfall where sheep are grazing along hilly fields. 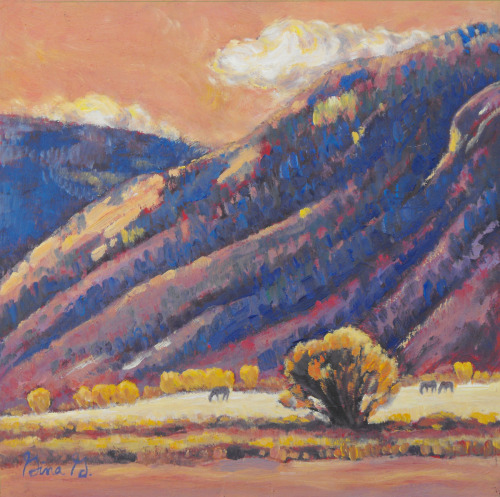 8" x 10.375"11" x 14.25"14" x 18.125"
Flickering light highlights a golden tree and shadows the hills beyond. 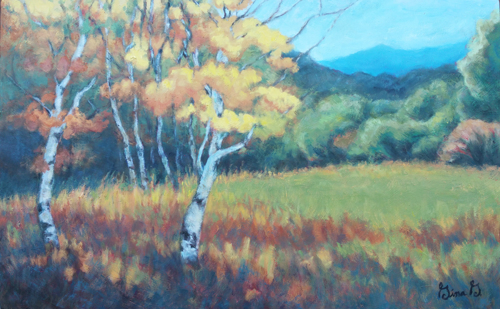 Golden aspens edge a green meadow nestled beneath a mountain ridge.